WSF has formally submitted its proposal to the Coast Guard for converting six Issaquah Class ferries to Liquefied Natural Gas (LNG) propulsion. The public comment period is open until January 12, 2015. If you have concerns about this proposal, please submit your comments as soon as possible: Go to http://www.regulations.gov/#!submitComment;D=USCG-2014-0935-0001 and click on the blue Comment Now! button. SEATTLE — The U.S. Coast Guard commander who will make the final decision about a plan to convert some Washington State ferries to liquid natural gas fuel says he sees nothing at this point that would stop the plan. But Captain Joe Raymond said he hasn’t made a final decision yet. A public comment period opened this week and runs to January 12. His biggest issue: Is it safe? Such a conversion would be the first time ferries in the U.S. would switch from the diesel they burn now to cleaner, cheaper liquid natural gas. The KOMO article soft-pedals the safety issue, instead stressing the promised cost savings and pointing out that LNG has been used for powering ships for several years “without a problem.” However, our readers may have seen our July guest post by WSF Chief Engineer Alex Zecha in which Mr. Zecha says that WSF’s risk assessment is flawed. Comments must be submitted to the online docket or reach the Docket Management Facility on or before January 12, 2015. This entry was posted in News and tagged LNG conversion on November 19, 2014 by Adrienne Rice Adams. The WSF LNG Conversion Proposal—Who’s Minding the Store? Editors’ Note: this article is a summary of a technical paper that Alex prepared on the proposed LNG conversion. The full report, including sources and references, can be accessed here. Guest posts are exclusively the work of their author(s) and do not necessarily reflect the opinions of the San Juan Island Ferry Group. Overview— For the last several years WSF has been working on a plan to convert the Issaquah class vessels from the use of diesel fuel to liquefied natural gas (LNG). The WSF proposal has numerous shortcomings, the most notable of which concern the issue of passenger and crew safety. 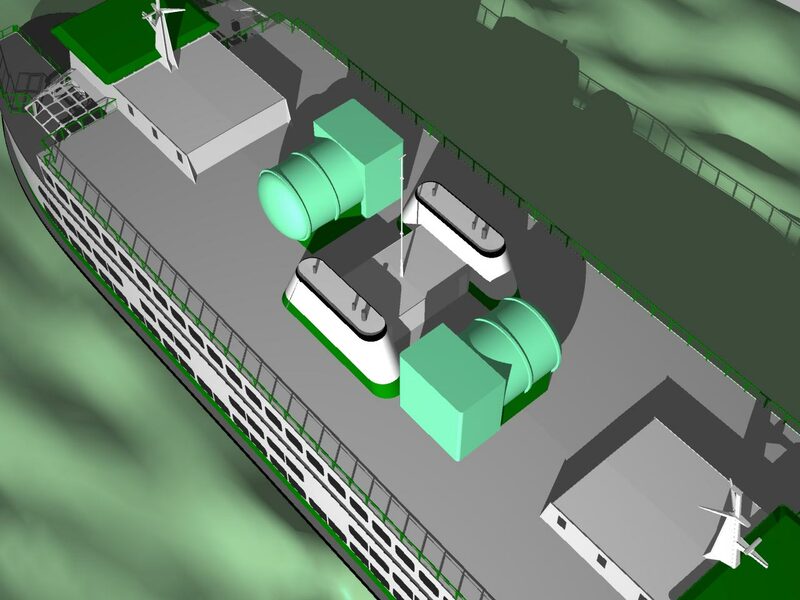 WSF proposes to install LNG fuel tanks on the top decks of the converted vessels, placing an extremely volatile energy source in much closer proximity to the general public than would be allowed to exist ashore. In other LNG applications such as utility plants, risks to the public are substantially mitigated via a robust regulatory body that establishes guidance for design and operation of the facility. The regulations applying to shoreside LNG plants in the vicinity of the general public don’t apply to maritime users; in fact, there is currently no enacted regulatory guidance regarding the use of LNG aboard passenger vessels.Instead of regulatory guidance, the US Coast Guard (USCG) is relying on a risk-based assessment for approval of the proposed WSF conversion. The USCG is not performing this risk assessment, nor are they contracting for it with a third-party vendor. Instead they are allowing WSF to use the risk assessment created by a vendor, Det Norske Veritas (DNV). Rather than following regulations that have ensured a favorable safety record with LNG, TheUSCG’s approval of the project is based on a risk assessment drafted by a vendor with a clear conflict of interest. This leaves ferry riders in the unenviable position of being subject to the introduction of a new fuel type with catastrophic failure modes but without the regulatory checks and balances needed to ensure public safety. WSF has accepted and passed along to the regulatory agency a risk assessment with numerous significant errors and omissions, all of which serve to understate overall project risk.Continued use of such a flawed product constitutes an abandonment of the duty of care required of all public servants. This entry was posted in Guest Posts, Info and tagged LNG conversion on July 29, 2014 by Adrienne Rice Adams. TRANSPARENCY NEEDED: WHAT IS WASHINGTON STATE FERRIES’ REAL LIQUID-NATURAL-GAS AGENDA? 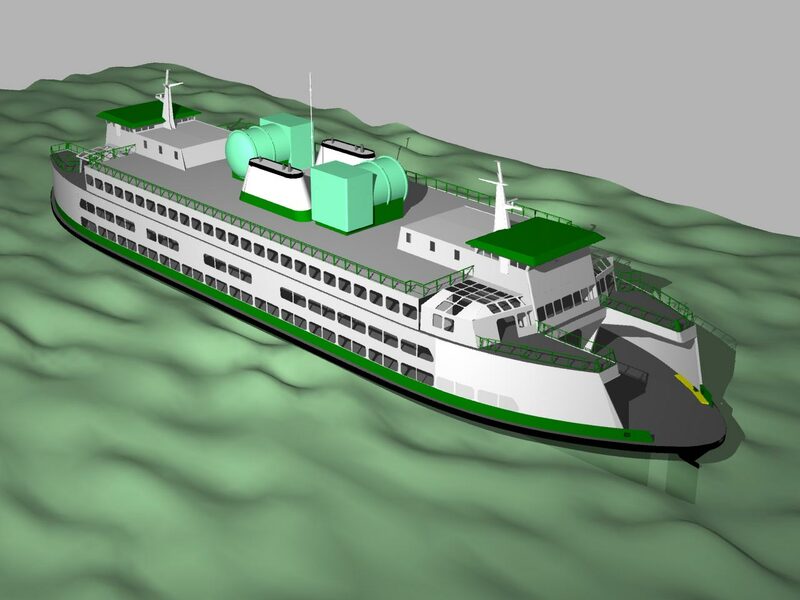 Since December 2012, Washington State Ferries (WSF) has repeated and publicly stated that it is “exploring” a conversion of part of the ferry fleet to liquid natural gas (LNG) fueI. After five months of “exploring” we know that WSF has sought and secured Coast Guard permissions for some of the steps required to make that conversion. The full story remains under wraps. The key, unspoken element during these past five months, is the purchase price of the LNG fuel. Will that price result in a savings on the WSF balance sheet over current petrofuels? Will the savings be sufficient to retire the capital cost of converting existing systems over to LNG and in how many years? In large part, the answers depend on what LNG fuel source(s) is accessed. By what natural gas pipeline that exists today, can WSF get LNG right to a refueling point for the six ferries that are proposed for conversion? How can WSF not identify the source of the LNG? It will either come from Canadian Tar Sands or from fracked Wyoming sources. They are both objectionable. (Alaskan LNG is reportedly insufficient to extend to fueling our ferries.) WSF may not know at this moment which source would be drawn upon, on a given date a year or two from now, but after all these months of “study” they surely know the full extent of probable sources for this fuel. Fracked natural gas from Wyoming is conveyed westward via a line that terminates at Klamath Falls, Oregon. The line was projected to extend to Coos Bay to a LNG saltwater terminal from whence the gas could be sold to Asian markets. It would have required extensive eminent-domain takings and five major coastal river crossings (including the Wild and Scenic Rogue) to reach Coos Bay. It has now been reported that the push for a Coos Bay terminal is being abandoned. (But not officially ‘dead’ yet.) WSF appears to be a potential major customer, even though the fuel would have to be trucked hundreds of miles via mostly 2-lane roads. The payoff of (maybe) reduced fuel costs and less-particulated Puget Sound air would be offset by the expense and hazard of highway trucking, ironically via diesel tanker trucks leaving elevated particulates along a lengthy highway corridor. A much smaller and less politically advantaged human population would be inhaling particulates that Puget Sound residents would not. Canadian Tar Sands are implicated in three major spills that have occurred during the week of April 2-6 in three different states/provinces! You may have heard or seen images of the very large Arkansas spill being ‘cleaned’ with paper towels–even though major media have barely mentioned it, and reporters were banned from the immediate area for several of the worst days thanks to Exxon’s political clout in that state. Then there was the large spill on the Red Lake Reservation in northern Minnesota and another spill north of the border. Shall WSF become a direct consumer of Tar Sands products as well? Liquid natural gas from Alberta is a byproduct of Tar Sands oil production from bitumen–the dirtiest fuel on the planet. It would be brought to the Vancouver area by a new Kinder Morgan pipeline from 700 miles across the Canadian Rockies. Then it would need to be conveyed further to WSF’s refueling locations. The real goal is export of Tar Sands LNG to Asian markets. Having a customer like WSF (and quite possibly BC Ferries) would substantially help massage the numbers Kinder Morgan needs in order to get approvals to build the new pipeline. Without a Kinder Morgan LNG line, the back-up strategy appears to be the much-opposed Enbridge fuel corridor across northern BC. Coastal First Nations affected by Shell Canada’s proposed LNG terminal at Kitimat say air quality and the number of vessels that will pass through their fishing grounds are emerging as the main issues they want to see addressed if the $12-billion-plus project is to go ahead. It appears that without one of these environmentally (and politically) objectionable LNG fuel sources, WSF has no real chance of financially justifying conversion to LNG powered ferries. The entire shaky proposal, of spending $85.6 million to convert six Washington State Ferries of the Issaquah Class, rests on a $2.00/gallon differential in the price of oil and the price of future LNG. If the actual cost of LNG turns out to be higher, for example if foreign buyers outbid domestic buyers and cause the price to rise, the proposal collapses. But once converted, WSF would have no real choice but to buy LNG at the going rate. Read this New York Times article on the supposed cleanliness of Tar Sands LNG. WSF should come clean with this information about their supposedly clean fuel conversion. Concealment as is their practice right now, fuels alarm that decisions have already been made that are being kept under cover until the last possible moment. Forest Shomer was appointed in 2004 to serve on the Keystone Citizen Advisory Group to WSF. He lives in Port Townsend and was a founding member of the regional citizens group, Ferry Community Partnership. This entry was posted in News and tagged LNG conversion on April 22, 2013 by sjbrooksyoung. “WSF, citing a study by a Seattle-based marine engineering firm, announced in August that it could save millions of dollars per year by converting. The cost of converting the boats to LNG engines would be paid for within seven years, WSF said then. “But the report released Wednesday by Seattle-based Cedar River Group and two other consulting firms wasn’t as optimistic. “I’m sure it’s somewhere hidden in the fine print of Washington state’s budget, but I couldn’t find the line item indicating the amount allocated to funding current and future consulting operations. I’m sure it’s an amount the Legislature doesn’t advertise. “Martinac Shipbuilding has until the end of the business day Tuesday to lower its costs for a new state ferry or lose millions of dollars in work. “The Tacoma firm is among a team signed to build a 144-car boat for Washington State Ferries. Vigor Industrial — formerly Todd Shipyards — heads the group. This entry was posted in News and tagged 144-car ferries, LNG conversion, WSF Governance on December 14, 2011 by Adrienne Rice Adams.